You are currently browsing the tag archive for the ‘Hamptons Beach Guide’ tag. Thanks to Editor Steven Nicastro steven.nicastro@patch.com at The Levittown Patch, we have the Long Island beach Guide, which we have excerpted the Hamptons Section. While the western Long Island beaches are great, world-class, even, the beaches on the South Fork stretching from West Hampton Dunes to Montauk are a rare breed, marked by rolling waves and soft sand set in front of some of the most dramatic real estate in the United States. Since the region has dozens of beaches, each unique, please click through to each expanded directory listing for more details. Fees and permits vary depending what village and town or village manages the beach. In many cases, parking permits are only available to locals, but taxi options and walk-ons give visitors the opportunity to enjoy the beaches. Beaches in this stretch are part of the Westhampton Island, a barrier island like Fire Island to the West. In this case, Dune Road runs the length of it, from the quiet of West Hampton Dunes, the party-heavy Westhampton Beach and ending at Ponquogue Beach in Hampton Bays at the gateway to the Hamptons. 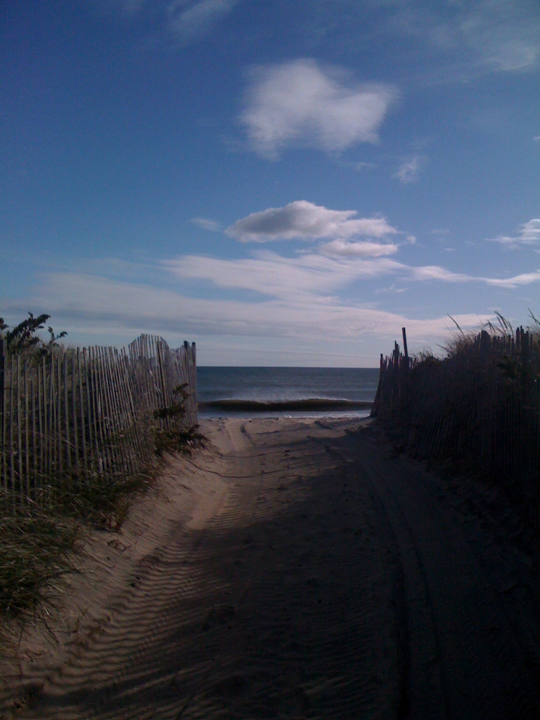 Quogue Village Beach – One of the quietest beaches on Dune Road west of the Shinnecock Canal, Quogue Village beach is low-key, with a playground and a concession stand to go with the perfect sand. Cupsogue Beach – This Suffolk County park is a local paradise, with long sandy beaches, a cabana, hiking trails, four-wheel access, free Wi-Fi and the chance to spot local seals sunning on sandbars. Lashley Beach – Managed by the Village of Westhampton, Lashley is offers a local hideaway and surfing spot that far less rowdy than the shores at the Dune Deck Beach Resort nearby. Ponquogue Beach – This beach, run by the Town of Southampton, is another local gem, stretching to the end of the barrier island. Beach, surf, concessions and showers are available, but the family atmosphere is what attracts most. It’s a gorgeous spot. Tiana Beach – Another county-run beach, but this ones has a few different faces. By day it’s lazy and family oriented, but with the nearby clubs Tiana can become a lot more spirited as the day rolls on. Meschutt Beach County Park – Being on the interior of the Shinnecock Bay brings still water to this county beach. Camping, boating and bathing are great here, and so is the seafood served at the Meschutt Beach Hut. Southampton’s beaches are pristine, with heavyweights Cooper’s and Sagg Main Beach often scoring top ranks in national polls. Permits and fees can depend on which municipality is running the beach and a few offer daily passes, often only on weekdays. Either way, the scenery is like no other, with perfect dunes and picturesque estates stretching for miles. Sagg Main Beach – This might be perfect Hamptons beach setting, with few features to get in the way of the scenery. Perhaps that’s why droves of seasonal visitors tend to choose this beach. Every other Monday evening during the summer, Sagg Main Beach is the site of a large drum circle, with other spectacles like the occasional visit from fire dancers. No weekend passes for non-residents. Mecox Beach – This Bridgehampton beach offers endless sand, and limited amenities. The setting is enough. Offers weekend non-resident passes. Flying Point Beach – If you aren’t local, be sure to make arrangements to get to this Water Mill Beach since no daily passes are available. Incredibly scenic, with the dramatic Channel Pond behind the beach and the Water Mill beach Club nearby. No weekend non-resident passes. Long Beach Park (Foster Memorial Town Beach) – Located in the hamlet of Noyac, Long Beach Park brings the expected calm of a bay beach, with still waters that are great for boating and fishing. On a narrow strip of land popular with sunbathers, it is a safe and scenic route for cyclists. Offers non-resident passes. Coopers Beach – Selected by “Dr. Beach” in 2010 as America’s best beach and, more recently, by National Geographic Traveler as the No. 2 family beach, Coopers is definitely a local champion. The only village beach with lifeguards, Cooper’s also gives visitors the option to rent chairs and umbrellas and has a complete concession stand to keep visitors well fed and hydrated. Grassy dunes, soft sand, and stately mansions dot the horizon at Coopers. And if the parking fee is too steep, the bike ride from Southampton Village isn’t so bad. The newly launched SpotRide will take you there for free. The rest of Southampton Village beaches each offer their own slice of the coast, and in many cases give locals and returning seasonal guests serene getaways from the often crowded “scenes” at some of the more notable beaches in Southampton. Summer-long permits are required at Fowler Beach,Cryder Beach, Road G Beach, Halsey Neck Beach, Wyandanch Beach, Gin Beach, Little Plains Beach and Old Town Beach while no permit is required at Road D Beach. Havens Beach – For fans of North Fork Beaches, Sag Harbor’s Havens Beach is your typical scenic Peconic Bay treasure, with views of sailboats on the smooth bay waters and Shelter Island’s coast in the distance. Typical Sag Harbor resident only pass required on weekends in season. The riches of Hamptons beaches continues into East Hampton, where the sands, waves and the mansions tend to swell as you move East. But cross into Montauk and the surf clubs and swank scenes start to change until you at last hit Camp Hero with its miles of wilderness, bluffs and the Montauk Lighthouse at The End. For East Hampton and Montauk beaches, fees and accessibility depend on who runs them, but services such as Hamptons Free Ride can help visitors without permits get on the beaches. Camp Hero State Park – The end of Long Island, Camp Hero is a wilderness like no other, with interior trails frequented by hikers, bikers and horseback riders, a museum, the historic Montauk Point Lighthouse and steep, dramatic bluffs that fall into the rough Atlantic Ocean. State park fees apply on the weekends, but the park is open for free during the week. A very popular spot for surf casting, too. Main Beach – Easily the most visited beach in East Hampton, Main Beach offers a full pavilion with food and drinks, piping plover nests and grassy dunes along a stretch of beach that yearly attracts droves for its perfect vantage point to watch the Labor Day fireworks. It can definitely get crowded, though. Village Parking passes required between Memorial Day and Labor Day…** Parking tickets will be given out for no pass! Georgica Beach – Normally a peaceful beach for visitors who want less hub-bub, devastating erosion from Hurricane Irene has left this beach closed while officials work to replenish the sand and fix the damage. Village Parking Permit required. Egypt Beach – On the other side of the Maidstone Club, Egypt is a bit more rugged than its neighbor Wiborg, but locals know it as one of the best places to catch the sunset. No lifeguards, though. Two Mile Hollow Beach – A large parking lot with a daily rate makes this beautiful beach another often visited attraction. Not much by way of amenities, but very relaxing. Indian Wells Beach – While the sand and surf are big draws here, as well as the family friendly atmosphere and volleyball courts, the row of food trucks that park there give this beach a unique draw. Surfers love it, too. Ditch Plains – Another beach loved by locals and visitors alike, Ditch Plains is a huge favorite of surfers. Only two miles from the heart of Montauk, the beach also has beautiful cliffs that stand out in a region where sand dunes are more common to find on the beach. Like Ditch Plains and Indian Wells, lifeguards can also be found at ocean beaches such as Atlantic Beach in Amagansett, Kirk Park Beach in Montauk and Edison Beach in Montauk while unprotected and still incredibly scenic beaches include Little Albert’s Landing in Amagansett Lazy Point in Amagansett, South Lake in Montauk, Beach Lane in Wainscott and Townline Road Beachin Wainscott. Kirk Park offers a daily rate on weekdays. The town also has a few bay beaches that offer calmer waters for young swimmers and spectacular boating and fishing. Those are Albert’s Landing in Amagansett, Gin Beach in Montauk andMaidstone Park in Springs.